The book presents a thoroughly revised edition, English translation, and study of the Dharma Patanjala, an Old Javanese-Sanskrit Saiva scripture transmitted through a single palm-leaf codex of West Javanese origin dating back to the 15th century AD. The cultural and doctrinal background of the text, as well as its codicological and philological aspects, are introduced in Part I. Part II presents an annotated diplomatic edition of the text with facsimile reproductions of the codex on facing pages, followed by a critical edition with English annotated translation. Part III is a systematic study focusing on the interpretation of the doctrines taught in the Dharma Patanjala in comparison with related Sanskrit texts from the Indian Sub-continent and Old Javanese scriptures from the Indonesian Archipelago. 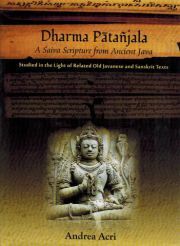 The author of the Dharma Patanjala adopted a variety of Patanjalaastangayoga instead of the Saivasadangayoga that is common in other Old Javanese texts, and attuned it to a Saiva doctrinal framework. When elaborating his hybrid system, the author followed a commentarial tradition to the Sanskrit Yogasutras that is closely related, yet not identical, to that of the Yogasutrabhasya. The Dharma Patanjala also documents an early tradition of speculative texts (Tattva), which was previously known to us only through two Old Javanese scriptures, namely the V?haspatitattva and the Tattvajnana. This important text thus fills a gap in our knowledge of Saiva theology and philosophy in pre-Islamic Indonesia, and also casts light on the origin and development of Saivism in the Indian Subcontinent.